The folks at the First Congregational Church boast that "our faith is 2000 years old but our thinking is not". They've so far paved the way for spiritual and individual acceptance in the city of Tempe. Their beginnings were humble. At the age of 61, Reverend Daniel Kloss from Kansas moved to Tempe in 1891. Following him were more Kansans, responding to a push for immigration to the Salt River Valley. They created a "Kansas Colony" in the city of Tempe. Many of these residents were interested in creating a Congregational Church. The church was officially founded in 1892, but would not have a permanent space until the construction of this building in 1899. The congregation has held the same site since its construction, a feat no other building has matched. The church members, whose numbers remained rather small through much of its history, were fiercely loyal to the church and its leaders. In 1935, Reverend Truman O. Douglass, a prominent and popular pastor of the church, became ill and was in the hospital and unable to lead the church for some time. In his absence the entire congregation (then including 137 members) came together to raise money and donate time to continue the church's services. 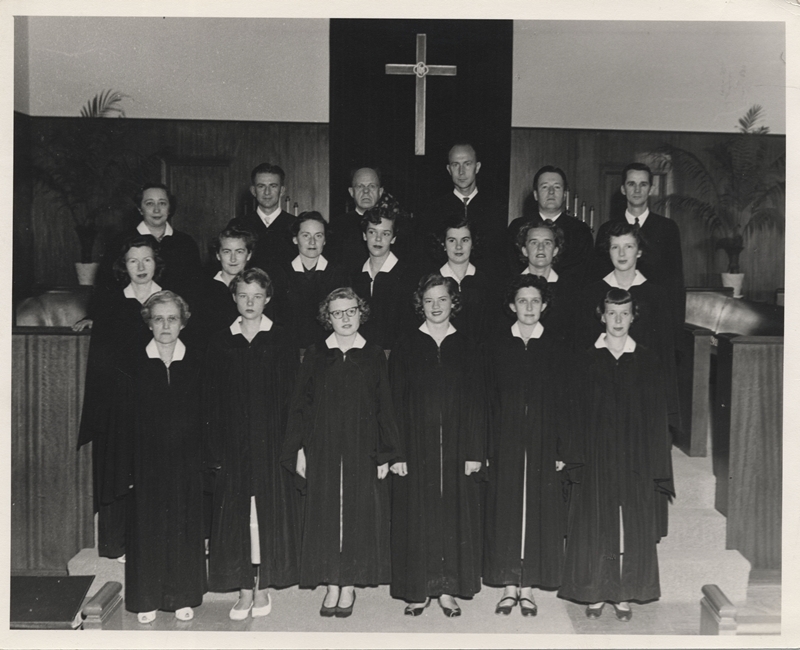 In 1939, the Congregational members were praised by the General Council of the Congregational and Christian Churches for their increased missionary work throughout that year. Executive Order 9066, signed in 1942, called for the internment of Japanese-Americans across the United States. 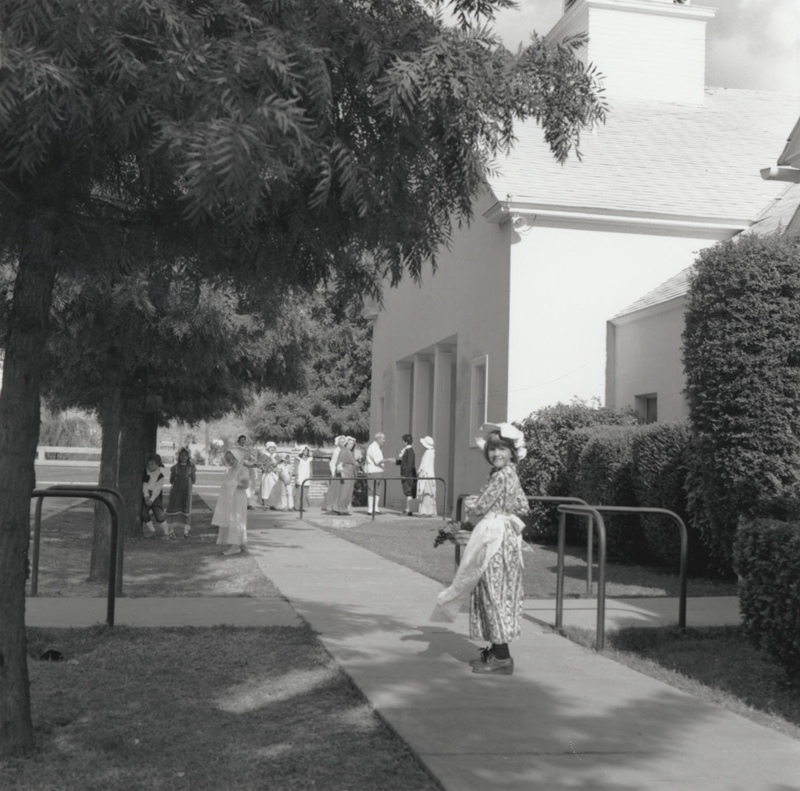 The members of the First Congregational Church immediately stepped up to provide blankets, clothing, and education to those citizens being held in the Gila River internment camp. These are just a few examples of the tight-knight, loyal, and accepting community that is the legacy of the First Congregational Church. This building is reminiscent of architecture primarily found in Ohio and built according to the "Akron Plan". The church has undergone many renovations since its original construction. A room for Sunday school services (before held in the church's auditorium) was added in 1910. The original steeple was removed between 1928 and 1929. A new social hall, replacing the 1910 addition and dedicated as Prior Hall, was added in the early 1950s. The most notable renovation was an addition of a sanctuary and the addition of a new steeple in 1953. The sanctuary was designed and constructed by local architect Kemper Goodwin, who also created the designs for the Tempe Municipal Building. All additions and renovations have been sensitive to the original design. Even old brick used in the original building was combined with new brick to create the new sanctuary. This property was the first to be designated for the local Tempe Historical Property Register in 2000. The congregation itself welcomes people of all backgrounds and regularly schedules meals for the poor and other philanthropic activities. The church now sits alongside an Islamic Center, and both are renowned for their good neighbor policy. Both organizations received the MLK Diversity award in 2002. First Congregational Church, 6th and Myrtle, ca. 1950: This photograph depicts much of the structure still seen today. Most additions have been in the rear of the building, however there was a large rectangular structure that was replaced by the steeple pictured here. Photo courtesy of Tempe History Museum. 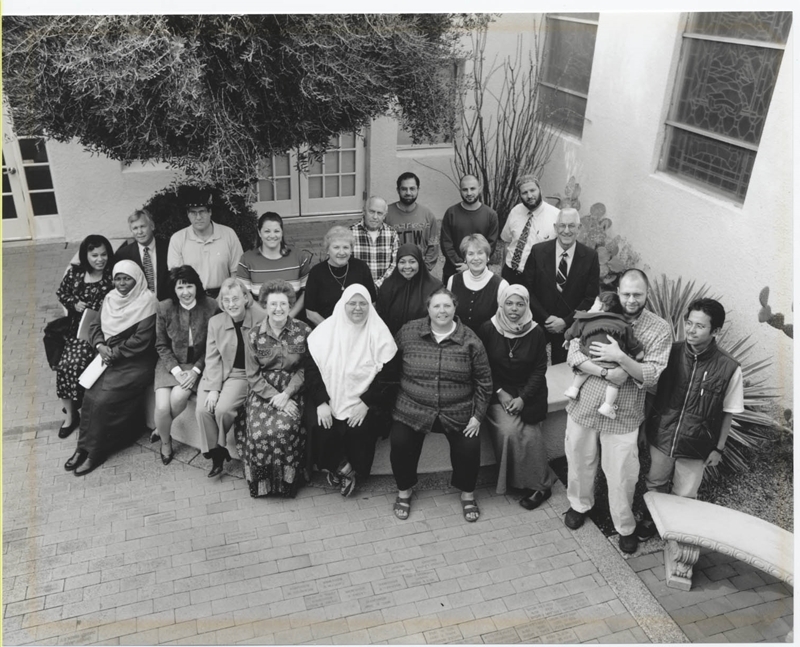 ~ Source: First Congregational Church, 6th and Myrtle, Tempe, Arizona. Photograph, c 1950. 1987.1.1574. Tempe History Museum. 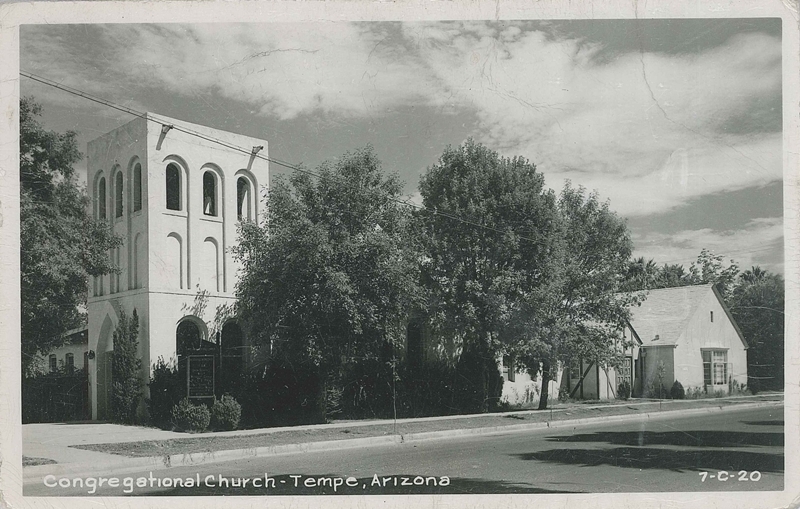 Postcard of Churches in Tempe, ca. 1909: The presence of churches and religious institutions in the city of Tempe made it a very desirable place to live for many people. Reverse-side text: "This should give you some idea of what a good place I'm living in." Photo courtesy of Joe Nucci. 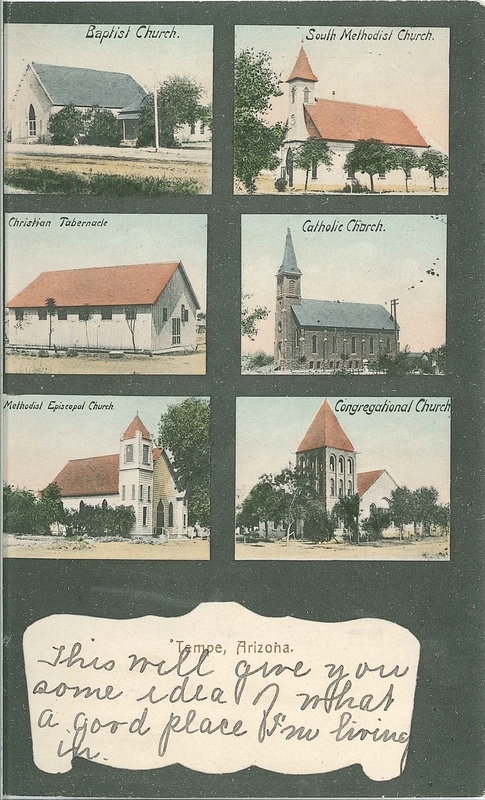 ~ Source: Postcard Depicting Churches in Tempe, 1909. Postcard, n.d. Joe Nucci Personal Collection. 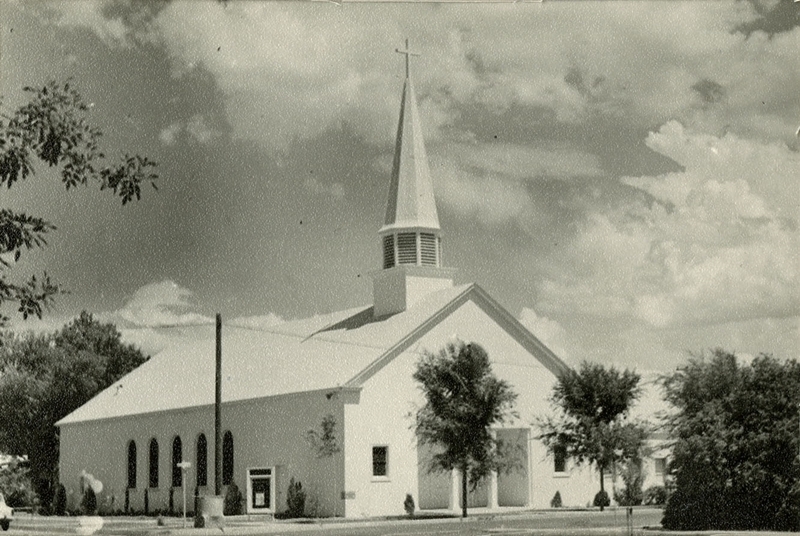 First Congregational Church, prior to 1956: This postcard depicts the rectangular, block structure located where the spire is today. Photo courtesy of Joe Nucci. ~ Source: First Congregational Church, Prior to 1956. Postcard, n.d. Joe Nucci Personal Collection. 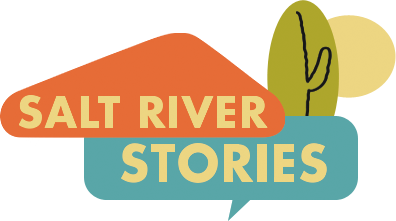 Holly Solis, “First Congregational Church,” Salt River Stories, accessed April 22, 2019, https://saltriverstories.org/items/show/53. Sherri Lesser. “First Congregational Church.” City Government. City of Tempe, Az, November 9, 2000. http://tempe.gov/index.aspx?page=1683. “Past City of Tempe MLK Diversity Award Winners.” MLK Diversity Awards, Tempe, 2013. http://www.tempe.gov/index.aspx?page=2226.